Ricky: Though Season 4 isn’t my favourite season of Smallville, it did have a handful of episodes that are quite good. Perhaps the quality of ‘Crusade’ built the season up for me, but its one of my favourite premieres of the series because it places many of the characters in very different circumstances from where Season 3 left off. It is also the introduction of Erica Durance’s brilliant take on Lois Lane and shocked viewers when Clark (or technically Kal-El) actually flew for the very first time. On a show whose mandate was “no flight, no tights”, ‘Crusade’ gave us a stellar flight sequence that is truly epic and the best time Clark flew in the series. James: “Crusade” is a great episode for a number of reasons, most notably being the introduction of Lois Lane, and of course the incredible sequence of Clark flying for the first time (though, to get away with it, the series positioned him technically as Kal-El, devoid of Clark’s humanity). In a show that had tried really hard to keep Clark grounded, that flight sequence was arguably the most exciting moment of the series up to that point, and still one of its most iconic. James: Long before The Flash got so much credit for introducing parallel universes, Clark Kent accidentally traveled to Earth-2, where he discovered he was found as a baby by Lionel Luthor instead of the Kents. “Luthor” is a great episode that acted as more than just a fun “what if?” scenario, and actually led to conflicts that would affect the entire final season, like bringing back John Glover for more Lionel Luthor greatness. Ricky: Despite the comics being riddled with parallel universes and alternate timelines, Smallville never played around with this concept until its final season. When it did, it featured a world where Clark was raised by Lionel Luthor instead of the Kents, bringing forth a very dark world where Clark Luthor abused his powers and killed his adoptive brother Lex for some twisted approval from Lionel. More than that, though, ‘Luthor’ explored just what it is that makes the Luthor name so dark; are Luthors raised that way or are they just inherently evil? After several seasons off the show, John Glover’s return as Lionel reminded us just how nasty he really was. Ricky: One of the earlier episodes that made the list was Season 6’s premiere ‘Zod’, but Season 5’s finale is where it started. ‘Vessel’ featured many aspects that are the hallmarks of great Superman stories: a nefarious scheme by Brainiac, Zod coming to Earth and Lex just being evil, but believing himself the hero. It’s somewhat at this point in the show that Lex really starts to turn to the dark side and Michael Rosenbaum sells the turn well, not to mention his take on Zod in the closing moments as all hell breaks loose across the planet. James: “Vessel” was, up until that point in the series, the most jam-packed and exciting finale of the series (which is saying a lot considering the meteor shower that arrived in S4). The arrival of Zod (via using Lex as a human host) and a city-wide attack by Brainiac put all of the characters in danger. It even ended with Lana embracing Lex (er, Zod) on top of the Daily Planet while Metropolis burned beneath them, while Clark was sent adrift into space, trapped in the Phantom Zone. Try saying again that Smallville wasn’t actually a full-blown Superman show in disguise. I dare you! James: “Justice” was a revolutionary episode when it aired in 2007, though it’d be seen as just another run-of-the-mill hour of something like The Flash or Arrow by today’s standards. Smallville had done a great job of introducing a few classic DC characters throughout the series, so teaming them all up for an actual Justice League mission was a no-brainer. I will say that it only increased my frustrations at Clark’s red jacket and refusal to embrace a superhero persona, but it was still a fun hour of superhero television nonetheless. Too bad it never led to an actual Justice League spinoff show. 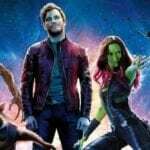 Ricky: In today’s age of superhero movies and television, team-ups and crossovers are everywhere, but it’s easy to forget how rare that was 10 years ago. Smallville’s ‘Justice’ was the first superhero team-up we received in the modern live-action age as Clark, Green Arrow, Flash, Aquaman and Cyborg worked together to shut down one of Lex’s labs for experimenting on meta-humans. All the previous heroes had appeared before in Smallville, slowly building to the beginnings of the Justice League. Though they wouldn’t appear in Smallville again for a while, this iteration of the League paved the way for the later seasons and arguably set the ground work for shows like Arrow and The Flash today. Ricky: As Smallville approached the end, Clark took some very big steps to becoming Superman during Season 9 as he proudly wore the ‘S’ shield on his chest, though was dressed entirely in black. In Season 9’s finale, Clark had a choice of leaving Earth behind to go with his newfound Kryptonian brothers and sisters in an effort to keep Earth safe from Zod’s clone or to stay behind and risk the wrath of Zod and his army. ‘Salvation’ examined the growing awe people felt around Clark as he got closer to embracing his destiny, but it ended in a pretty well choreographed fight between Clark and Zod where the hero used both his strength and wits to defeat the would-be tyrant. James: “Salvation” may be the best single season finale of the show, and is a story I could easily see playing out in the pages of Superman comics. The episode is jam-packed with fantastic moments: Zod pretending to be the Blur to trick Lois, Lois discovering that Clark was actually the Blur, the great final fight sequence in the rain, Clark receiving his Superman costume from his mother, and of course, an opening sequence that flashes forward to 2013 and shows Superman saving a plane in front of the Daily Planet! It’s Smallville at its very best. James: “Onyx” is one of the series’ best Lex episodes. Splitting Lex in two – his evil side and his good side – provided a fun and engaging way to explore his inner conflict, while giving viewers a taste of the person he would eventually become. It also gives Michael Rosenbaum the chance to play a more classical, villainous Lex, chewing the scenery with a few great, memorable monologues.